1. Brown Lace Up Boot, Office £65. | 2. Tweed Shorts, Topshop £38. | 3. Autumn Lipstick in Plum Rebel, No7 £9.75. | 4. Faux Fur Coat, Topshop £98. | 5. Leopard Fur Collar Coat, Topshop £85. | 6. Double Finger Bird Ring, Urban Outfitters £8. | 7. Tapestry Frame Bag, Topshop £40. | 8. Suede Lace Up Wedge, ASOS £60. | 9. Leopard Print Scarf, Republic £8.99. |10. Tooled X-Body Bag, Urban Outfitters £32. |11. Knitted Fairisle Cardigan, Topshop £55. |12. Animal Print Dress, Warehouse £45. |13. Peter Pan Smock, Miss Selfridge £45. |14. Burgundy Tights, Topshop £17. |15. Cloche Felt Hat, ASOS £18. |16. Butter Nail Lacquer, Boots £10. |17. Brown Leath Ankle Boots, River Island £74.99. Before I made this list I imagined it to be full of colour, deep burgundy, rusty orange, chocolate brown, and deep green, instead it seems to be mainly black and cream! Oh well, I'm sure my autumn wardrobe will be more colourful in reality. There's so many lovely clothes available at the moment that all look so cosy, but there's something slightly wrong about buying winter clothes in August, despite how rubbish the weather is! Although I'm starting to feel like I should be buying these things now, because that lovely chunky knit cardigan has already sold out! There is one issue with doing this though, I'm so fickle! If I bought a winter coat now, I'd probably hate it or have seen one I like even more by the time winter arrives! Anyway, one thing I do know is that I want my wardrobe to be full of peter pan collars, I love them. Another thing I'll be wearing a lot of is leopard print, hopefully with a 60's bouffant and plenty of flicky eyeliner! I'll probably exclusively be carrying satchels, or boxy shaped bags, I love the tapestry one above. Loafers and lace up ankle boots will be the only footwear I choose, teamed with chunky wool socks and opaque tights. I also want a collection of black felt hats! No matter the shape, bowler, cloche, trilby or pork pie I want plenty of hats. There will always be room for tweed as well, shorts, tapered trousers and oversized blazers complete with elbow patches! I'd love a deep wine colour on my nails or lips too. What will you be wearing this autumn? I just adore that tapestry bag and the chunky knit cardi, I've seen a lot of these around online, I can't wait to buy one for Winter. those office boots are on my 'to buy' list too & that peter pan collar dress from miss selfridge is lovely, i might just have to get it as well! i'm planning on lots of chunky knits over dresses & with everything...i'm one of those perpetually cold people so i need lots of warm layer-able clothes! Amazing blog! I think you have a new follower. Love all of the clothes on your wishlist. Just bought the Topshop coat with leopard print collar. Its so delightful! You have a beautiful page header! I love your wish list. I need to start working more on my autumn wardrobe wants too. Lots of knee-high socks, chunky boots, big oversized knitted cardigans, capes, circle scarves & floral dresses in muted blues, reds & greens. I love your wishlist. The tapestry bag, suede wedges & Office boots - swoon! I've got my eye on these now. 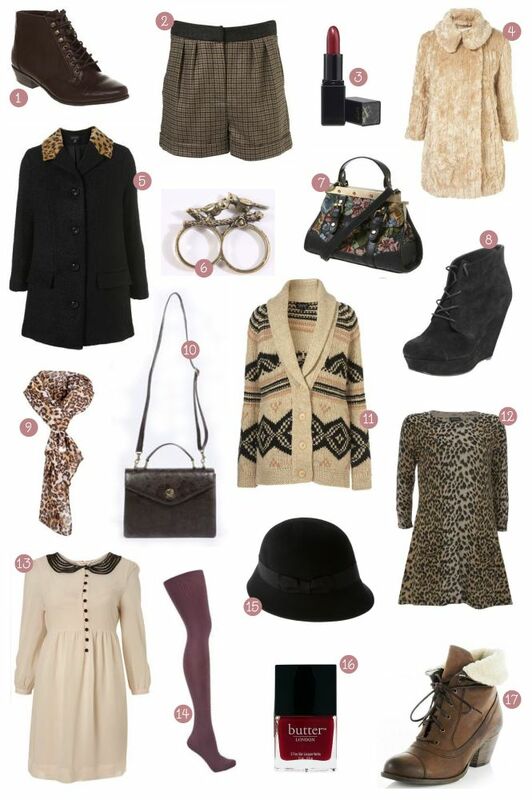 Great picks I love all of these, especially the peter pan collar dress from Miss Selfridge. Oh my goodness! I'll just copy and paste this into my "fall needs" folder thankyouverymuch! These items are all quite great on their own but when you see them together you truly create such a fantastic look. Your wishlist looks perfect!! I love the bird ring, cross body bag and leopard dress! I love all of them, but i really love #1 and #13! i'm the same with coats, too, i'm torn right now between wanting to buy an amazing one from topshop before it sells out, and waiting a month or so incase i end up hating it! not to the mention the fact we shouldn't even be thinking about winter coats yet! This collage is amazing, seriously too many pieces I love to point out. ♥ love, love, love daria. absolutely in love with all your picks! all of them are awesome, and my faves are Faux fur coat (L) and Suede Lace Up Wedge, what an amazing pair of wedges(LL) must follow you, your blog is awesome, u got an amazing sense of style! Ah seriously loving all of this. I really love the tapestry bag, but Brian says they are old lady bags. I now have to make a point to show him them whenever we are in a fashionable store. Definitely a cute bag. beautiful post! i can't find a single item which i wouldn't want to own myself. i totally agree on the chunky wool socks and opaque tights combination! you have to get the cloche hat, you would look very very cool! Great wishlist! A big comfy cardi is on my list as well. And yes! Peter Pan collars look so great. i love number 17... they are perfect for the winter!!! Hey there I've tagged you on my latest post. Hope you'll join in I'd love to know your choices. Lizzie, I just found your blog from LLYMLRS and love it. Can I ask where you got the white bedside lamp in your header image? I've been looking for something similar. Thanks!! beautiful collection! i have been lusting after that coat with the fur collar (in green) for weeks now. really love this post, see you on the futur,I hope!